Grandma always said “it’s a poor rooster that doesn’t crow about his own henhouse” and aw shucks, that kind of stuck with us. We are a service driven company first and foremost and we are very, very good at it. 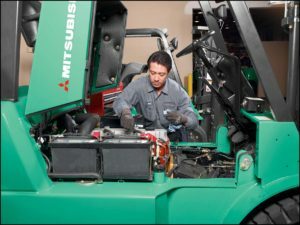 We’ve been a Mitsubishi Forklift Truck Dealership for many years but we started as an independent service provider and since that was our only business, we had to be better. Know, we’re known for our legendary customer service, rapid response time and “fix it right the first time” reputation. We have thirty five years of experience servicing all the various makes and models of forklift trucks and other handling equipment in your warehouse. 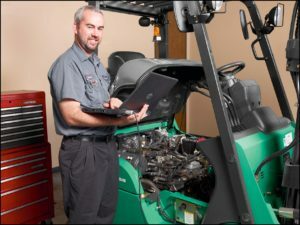 We have some of the best factory trained forklift technicians in the business and they fix it all! It is a myth that only the Original Equipment Manufacturers (OEM) Dealer can work on your forklift truck. • A live service specialist answers the phone during business hours-you don’t have to press one for service! • Two hour response time guarantee to your emergency service calls 24/7/365. • A specific technician (with a backup) dedicated to your account. This is the key to preventing repetitive and incomplete repairs. • 72 hour maximum turn around time on all repair quotes. 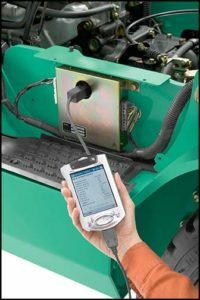 • In house industrial battery service since the battery is the most important component of your electric forklift truck. • A broad range of related services such as mobile welding and fabricating, dock, overhead door and entry door service, parts, repair and installation to provide you a one stop shop. • Plant maintenance services on conveyors, compressors, industrial engines, shrink wrap machines and other plant equipment. • Partnering Account Reviews conducted periodically with your staff to review costs and work to resolve problems. Call NOW or click here to email us and give us a chance to show you how good we are on your very next forklift breakdown! !